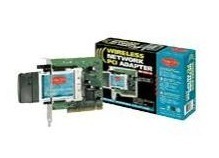 With the Wireless PCI Adapter, you can create a wireless network in combination with one or more Wireless Network Adapters (USB, PCI, or PC card version). With the Sitecom Access Point, you can log on wirelessly to an existing network. It is suitable for PC's with at least one free PCI slot.